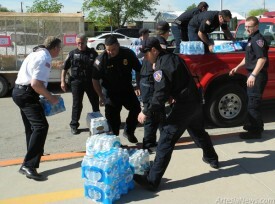 Students, staff and families of Grand Heights Early Childhood Center collected a total of 665 cases of water and Gatorade for Artesia’s law enforcement and fire departments through their “Thirst Responders Drive,” held in honor of National Police Week. The drive was held in honor of Cpl. D. Robert Harvey, son of kindergarten teacher Diana Harvey, who was killed in the line of duty. 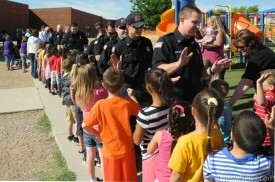 The cases of water and Gatorade were distributed to the Artesia Police and Fire Departments and the Atoka and Riverside Volunteer Fire Departments this morning at the school, where first responders were enthusiastically greeted by the Eager Beavers.